Save all open tabs to launch later in Chrome and Firefox: – We use web browsers to access the contents of world wide web. Chrome and Firefox are the two prominent browsers among the innumerable browsers available. These browsers allow us to open several tabs in a single window. Sometimes we might have more than 10 tabs opened in a single browser window. That’s when the power fails and the battery cheats; computer restarts and all the opened tabs are long gone. What if we need to turn off our PC but need to relaunch these tabs when we start our PC next time? It is very difficult to remember these tabs and relaunch them. Force closing chrome and pressing Control + Shift + T when we reopen Chrome is a way to relaunch these tabs. Well, this may not work all the time. Here bookmark all the tabs feature becomes beneficial. Read on, to learn how to bookmark all the tabs in Chrome/ Firefox. 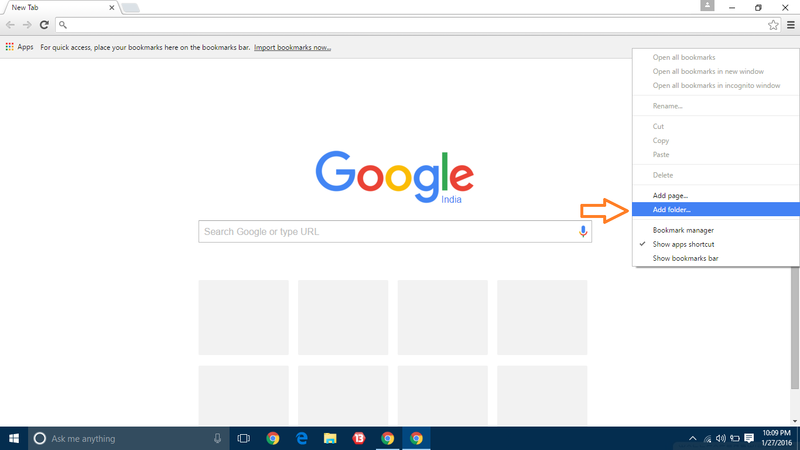 Right click on the Bookmark bar area on the top of your Google Chrome/Firefox browser and click Add folder. A new dialogue box will open. Click on the Bookmarks bar folder and give any name to the new folder to be created. Then press save. Open the tabs you want to save for later, right click on any one of the tabs and select Bookmark all tabs or press Control + Shift + D.
From the dialogue box click the previously created folder as target folder and give a name to the bookmark.Click save to save all the bookmarks. Now close and reopen Google Chrome/Firefox. To restore previously saved pages right click on the folder in which all the bookmarks are stored, then select Open All Bookmarks. Yeah, Now you have relaunched all the previously saved tabs in your Google Chrome/Firefox web browser.